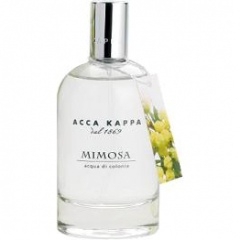 Mimosa is a perfume by Acca Kappa for women and was released in 2004. The scent is floral-fresh. The production was apparently discontinued. 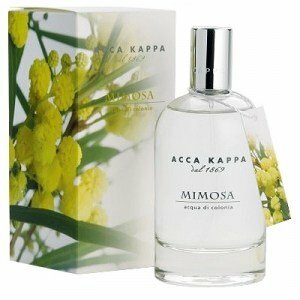 A mimosa perfume will be most likely innocent, smooth and light. Acca Kappa's one fulfills al requirement, so it is allowed to enter the Pantheon of Light Flowers and sit down on its (her) well deserved place on the shelves. A creamy, highlander freshness floods from the bottle, that really makes spring in your room even in the middle of the winter, however it fits really only to spring, so I do not wear it in cold weather, that would be a sad thing. This childish and gentle scent gets dynamism from citruses without disrupting the breach of the peace. MIMOSA is quite similar to MIMOSA POUR MOI, but L'Artisan's creature is colder. MIMOSA does not change much, durability is average, sillage depends on mood and the part of body - it likes more to be near to the body, and less on wrists. For receiving fragrance-translated smiles, the best place is the elbow, then you will feel it daylong. Write the first Review for Mimosa!